As students gear up this fall for the college search, it’s easy for families to feel overwhelmed. Reports about the increasing number of schools to which students are applying and the low acceptance rates reported by some colleges and universities elevate anxiety levels and shed a negative light on the search and planning process. But are students who apply to dozens of colleges the norm, or do they make news because they are not? The Naviance Class of 2015, representing more than a quarter of U.S. graduating seniors, tells a different story. According to our recent data*, students are being strategic about where they target their college search. The majority of students in the Naviance Class of 2015 applied to fewer than six schools. In fact, the majority of these students only planned to apply to one to five four-year colleges and/or one two-year college. 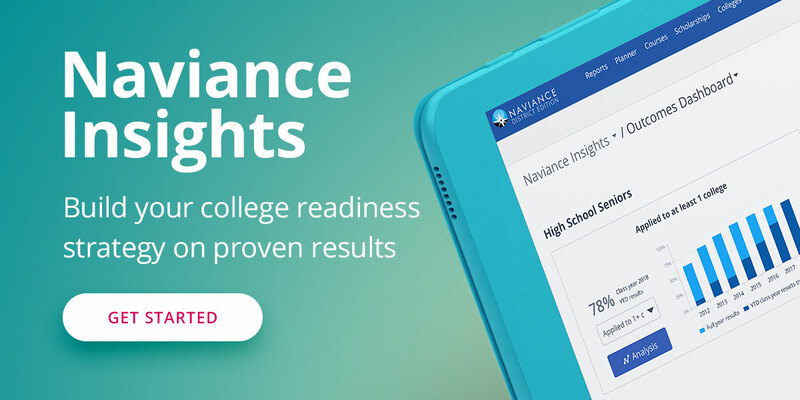 Naviance students also reported promising college acceptance rates, with eight out of ten students being accepted to at least one college. This figure is encouraging because it shows that, even though the majority of Naviance seniors from the Class of 2015 applied to fewer than six colleges, the majority were accepted to at least one four-year or two-year college. View our complete infographic below for other insights into the Naviance Class of 2015, like students’ top strengths, which can be informative for students and families as well as for college admissions and retention staff who are preparing for incoming freshman classes. * This data is drawn from non-personally identifiable, aggregate, self-reported data from a sample of approximately 1.2 million Naviance students from the Class of 2015. The “Class of 2015” refers to graduating seniors using Naviance as of June 8, 2015.